Tim Van Egmond weaves together tales, tunes, and songs – from the rib-tickling to the spine-tingling to the heart-warming. MUSIC flows in and around his stories through his singing and playing on a wide variety of traditional instruments, including hammered and mountain dulcimers, guitar, conga drum, and limberjack (a dancing wooden puppet that taps out a rhythm on a paddleboard). 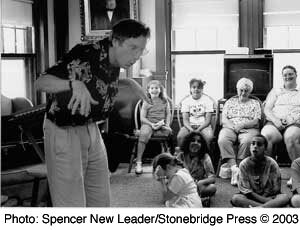 His dramatic use of VOICE and MOVEMENT brings stories vividly to life, and his gift of encouraging PARTICIPATION makes for high-spirited and engaging programs. Each program is tailored to meet special needs and interests of sponsors and participants. 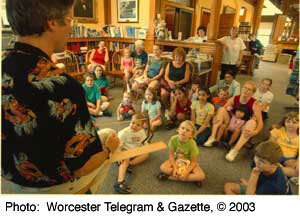 Summer Reading Programs for Libraries – drawn from Tim’s extensive repertoire to celebrate special themes and encourage reading. The Story Bag – following an age-old tradition, listeners choose one by one from an assortment of intriguing objects that arouse curiosity and spark the imagination, each representing a specific tale for the telling. Seasons and Holidays – Special programs for Halloween, Harvest and Thanksgiving, Christmas/Hanukkah, Winter Solstice, St. Patrick’s Day, and more. Building Bridges – stories and songs of community and connection, a celebration of multicultural diversity promoting understanding and appreciation of our common humanity. Hearing Nature’s Voice – stories and songs of our relationship with Mother Earth; learning the importance of living in harmony with the natural environment. A program specifically about Recycling is also available. Mystery Mastery – Catching the thief, solving the crime, guessing the riddle! Programs for Adults – adult reading discussion series on various themes, “You Say ‘Potato,’; I Say ‘Pomme de Terre'” for the 400s section, Languages.